China Shores is an Oriental-themed slot machine coming from the Konami creative kitchen. The game uses 5 reels and 30 fixed paylines and takes you to a bamboo wood, a dwelling place of pandas. The reels are home to symbols related to Chinese culture such as letters, golden turtles, porcelain jars and lanterns. Our new friend panda acts as Wild and lands on the reels 2, 3, 4 and 5 exclusively. It substitutes for all the symbols including Scatters thus helping you complete more winning combinations and unlock the free spins feature. The Yin Yang symbol stands for Scatter that pays when appearing on consecutive reels starting from the leftmost position. Once 3, 4 or 5 Yin Yang Scatters hit the reels left to right, 8, 10 or 15 free spins will be credited to you respectively. All winnings obtained from free spins will be doubled. The feature comes with a twist: once activated, it will offer you to choose if you will play free games or take a mystery credit prize that can be anywhere between 40 and 319,500 coins. A minimum and maximum amount depends on the number of free games you have received. Another option available within the Balance of Fortune feature is to play a number of free spins and exchange your payouts from them for a mystery credit prize. This applies only if you have 20 more free turns to play. You can get as many as 450 free games if you cover the grid with Scatters entirely and the feature can be retriggered. The golden red Chinese writing symbol is the top paying one. Land five of these on a payline and you will win 1,000 coins. If you manage to land 5 Scatters on adjacent reels, not only that you will get 15 free spins, but you will also win 100 coins on top. Awarding doubled payouts, the free spins feature can provide you with a lucrative gaming experience and if you want to risk for higher payouts, you can increase your bet level up to 10 and wager up to 300 coins per spin. The maximum possible payout in the China Shores slot stands at 300,000 coins. 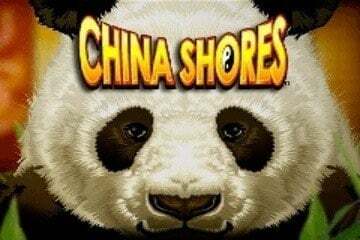 If you have already played China Mystery, another Konami Oriental-themed slot, you will easily notice that China Shores is the clone of this title. They share the Balance of Fortune feature that allows players to choose from playing free spins or taking a mystery credit prize. If you like risking, you should give it a try. China Shores features simple graphics too with the reels set against a dense bamboo wood. We have already played dozens of games themed on pandas and, unfortunately, this is just another take on the theme. At least, it is designed in green, which will definitely provide you with a relaxing gaming experience. While playing the game, you will hear generic sounds of turning of the reels, yet the things get a bit better when a big win is hit and some music come in play. After all, the Konami product was originally created for land-based casinos and later optimised for online play. With a 300,000 coin maximum payout, up to 450 free spins with doubled payouts and mystery credit prizes, China Shores will offer you multiple opportunities to win. If you are looking for a game that pays better than it looks, the Konami release can be a perfect fit for you. It comes with an RTP of 96.1%, so give it a spin or two and see for yourself how it works and pays.